Kakatiya University supplementary result: The results of supplementary exams held in October/November for undergraduate courses have been declared by the Kakatiya University. All those students who had appeared for the same are required to check their respective scores at the official website – kuexams.org. The exams were conducted for BSc (MPC), BSc (BZC), BCom III year, BCom II year, BCom I year, BA II year, BA III year and BA I year students. Kakatiya University Conducted Under Graduation Supplementary Examinations 2017 in October and November 2017. The Candidates who were appeared for KU Under Graduation Supplementary Examinations 2017, they are waiting for their results. Kakatiya Universoty Under Graduation Supplementary Examinations 2017 results has been released by the KU VC. BSc, BCom, BBM and BA Final Year, Second Year and First Year results have been uploaded on its Officialwebsite by the KU Official. Candidates can check their results in given following links. 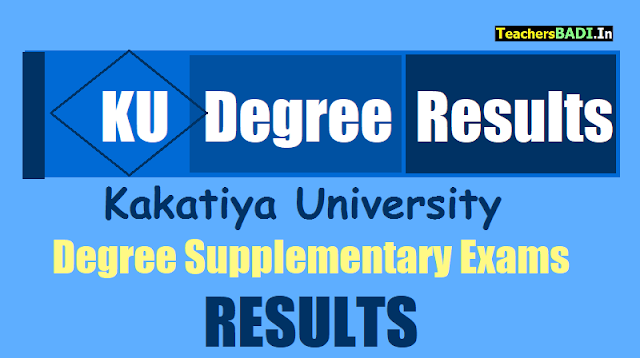 Kakatiya University has declared the result of supplementary examinations held in November/December 2017 for undergraduate courses. The results have been declared for BSc, Bcom and BA first second and third year students. Those who have appeared in the examination can check their results by visiting the official website of the University. 6) Result will be displayed on the screen. As the website is running slow due to heavy traffic, candidates may need to wait and try again to check their results.